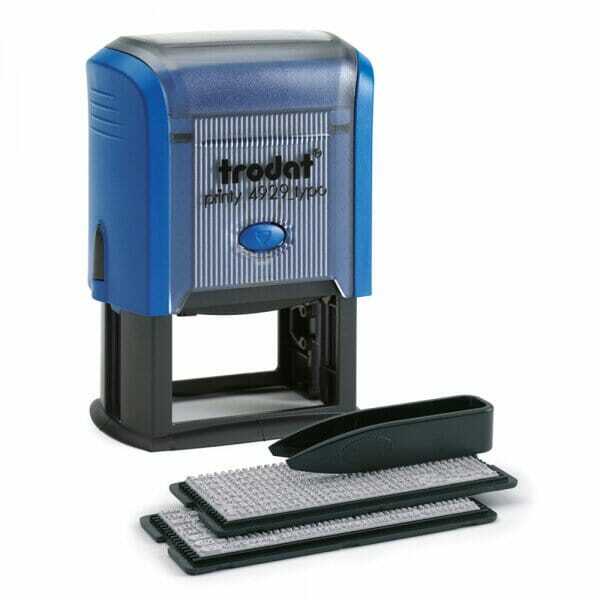 The perfect stamp for around the home, users can personalise and create your own D-I-Y self-inking rubber stamp with the Trodat Printy Typo. The 4929 allows users to create their own messages quickly and easily. Each kit contains a self-inking stamp, a selection of letters, various characters/symbols, tweezers for setting the message and a replacement pad. All of the characters are reusable, which means the plate can be reused several times- creating a new impression each time. The stamp creates an impression of 50 x 30 mm, this allows up to 6 lines of customised text. The Typo 4929 like all stamps from the Printy range are supplied with a black ink pad. Should you want a differing coloured ink pad the 6/4929 is the correct pad, which can be purchased through the website and is available in blue, green, red or violet. Customer evaluation for "Trodat Printy Typo 4929 - up to 6 lines of text"